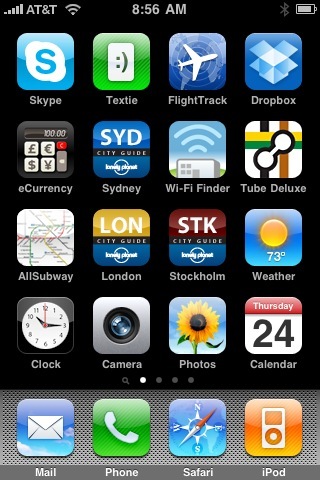 I spent quite a bit of time before a recent trip to Europe investigating what iPhone Apps I might want, to take some of the hassle out of traveling. Most of the lists out there are for traveling around the US, not the “I’ve-switched-off-fetch-new-data-so -I-don’t-have-a-thousand-dollar-phone-bill-from-my-trip-to-London” kind of traveling I do. That means they have to work over Wi-Fi or utilize data that’s downloaded to your phone in order to be of any use. Unfortunately, in the app store these attributes are rarely mentioned, except in reviews by frustrated purchasers who realize they can’t use an app like they expected to. All Subway – Download the maps of basically every subway system on Earth and have them all saved to your phone for later use. This app can be very slow, which may well have more to do with the age of my phone than the app. Cost: 99 cents. Tube Deluxe – I think my favorite thing about this app is how when I fire it up, it tries to use my location to show me the nearest stations, and gets very confused at the fact that I’m 5329 miles from any of them. The maps all work without a connection, though the status of service/location features do require Wi-Fi or data. Cost: 99 cents. Lonely Planet City Guides – Super-handy maps and details on restaurants, shops and attractions, all downloaded to your phone so that you can use them anywhere. Cost: Somewhat pricey at $5.99 each, but cheaper than the paperback book version.